It's raining - not exactly a surprise in Britain, and it's raining hard. Puddles like lagoons pool at the verge and grip's gone nebulous. The nervous Panda at the head of our B-road convoy has deemed 35mph appropriate – which is fine. But the Alpina B5 fancies doing twice that, and can see no good reason not to. So we do. The B5 is the fastest accelerating Alpina yet, a truth not unrelated to the fact that it is also the first all-wheel-drive Alpina. On this maelstrom of a B-road I select third gear, pull out and gingerly nurse in some throttle, the road ahead clear of oncoming traffic if not of wind and rain and squall. We accelerate; no drama, no wheelspin, no fuss. More throttle. A deep, feel-it-in-your-spleen baritone from the Alpina's exhaust, oddly reassuring, as if something this cultured couldn't possibly get you into trouble. Then I give up on the softy-softly thing and just get the pedal down. Like an AMG V8 the B5's strong, smooth low-rev drive gives way to a soaring top-end that vindicates your (brave and laudable) decision to spurn a performance diesel every single time you wring it out. And like an E63, the fact that you can deploy this magnificent engine with joyful abandon, even when the rain's horizontal, is proof that all-wheel drive isn't a bad idea when you've 600bhp to play with. Where does the love affair start? Your fondness for the B5's V8 is kindled first by the throttle response, which is instantaneous. Alpina installs its own bigger, twin-scroll turbos (between the cylinder banks, to prompt hard-working cooling fans every time you park up) and an uprated cooling system. Inside, the masterpiece gets Mahle pistons and meatier NGK spark plugs, to better cope with the hostile conditions created by 1.4 bar of boost and a 10:1 compression ratio. And that fondness blossoms into profound love the first time you find the space to extend it. Alpina claims 600bhp, 590lb ft and 0-62mph in 3.5sec. (The M5's good for 591bhp, 553lb ft and 3.4sec.) As the tacho on the blue-faced, Alpina-branded instruments swings past 3000rpm there's nothing so uncouth as a step-change in ferocity. 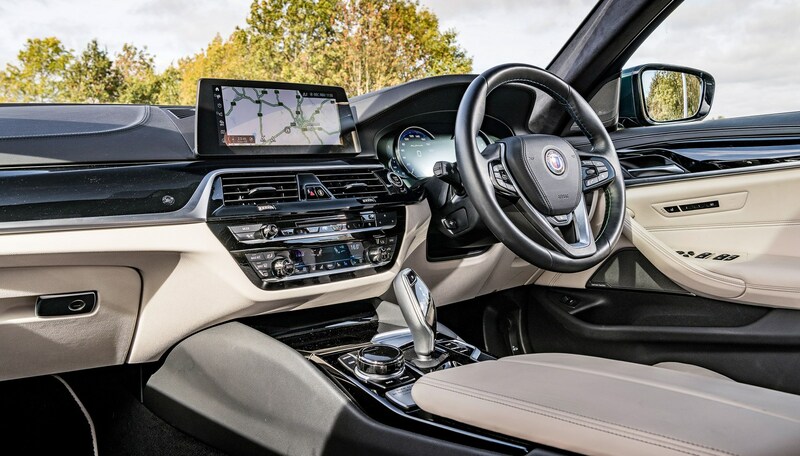 Instead there's just what feels like an exponential increase in the rate of acceleration, the Alpina gathering speed like dropped ordnance all the way to the soft limiter at 6500rpm. But there's far more depth to it – and its appeal – than that. You sit in the 5-series' fabulous cockpit, wishing the enormous A-pillars weren't quite so obstructive but glad of the chunky wheel rim in your hands and the good sense of iDrive. Then you notice the word 'Limousine' on the little cockpit plaque. Impressively comfortable though the B5 is (the ride quality on those lickable 20-inch wheels is very good), to own one and only ever drive it like a limousine would be a terrible waste. 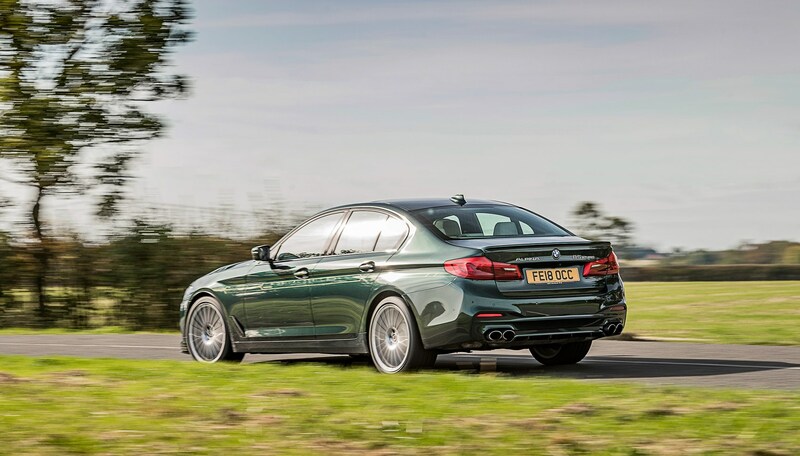 The agility and precision are at once familiar from the base 5-series and yet altogether more convincing here, as they should be given the price difference. The standard xDrive 5's good on body control and traction but the B5 elevates both to new heights, while also throwing in an unfailing front end and a clarity of communication that soon has you enjoying yourself in a 600bhp, 2015kg super saloon as you no doubt once did in a Fiesta on a wet field. This is not a fluke. Alpina's engineers have lowered and stiffened the front springs, specified its own wishbones for 1° of negative camber and recalibrated the BMW's systems to suit, including the rear-wheel steering, xDrive and active roll control. The result is slack-free steering and a delicious – and scarcely credible – sense of connection with a chassis of serious ability. That BMW continues to build cars that can feel like this but remain this refined is cause for celebration: that there exists in Germany a bunch of engineers with the time, resources and expertise to push the package still further is cause for a week-long bender. And when it dries up? With dry, sinuous tarmac unfolding ahead, the B5 is mighty. The brakes are sensitive in gentle use, something that can't be said of the M5's ceramics, but don't want for power. And with each corner your appreciate the resistance to understeer, to roll, and to letting physics corrupt the fluency of a chassis that, while harnessing myriad complex systems, feels entirely intuitive as it does so. The xDrive is particularly sublime, the car tightening its line if you're throttle-greedy mid-corner while still driving forward remorselessly. On paper the Alpina is an M5 rival. In truth they're very different cars, the M5 a far feistier proposition aesthetically and dynamically. Me, I'd go for the fast 5-series that isn't even a BMW, and revel in all the Alpina magic – the badge, the stripes, the sheer 'Erm, why?' of the thing – that so reliably baffles the uninitiated.